I wanted to give people a preview of Jackie Musto's cover art for Strange Tales of Songling. I think the artwork is incredibly evocative and captures the complete range of the game beautifully. I talk about this in the podcast discussion below, but the top portion of the image shows three types of creatures. On the left there is a ghost, in the middle is a monster inspired by the creature from the Pu Songling story "Painted Skin", and in the upper right corner is a fox spirit seducing a scholar. Pu Songling stories include a vast range of supernatural elements. But these three seem to have the strongest resonance and association with them, so I wanted them to be on the cover. Painted Skin for example has been made into films many times. 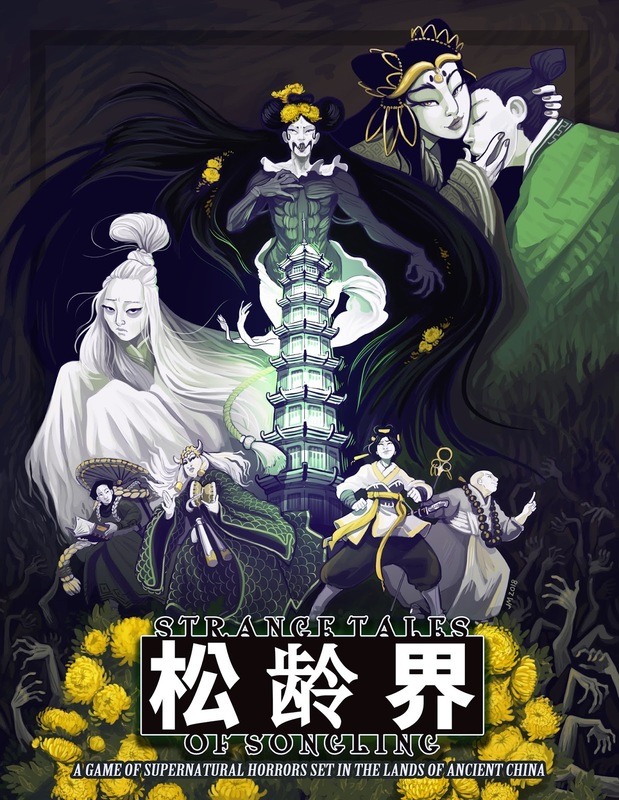 Ghosts and Fox Spirits come up frequently in Strange Tales from a Chinese Studio. I explain some of my thoughts about their appearance here in the podcast. Below them we also have four characters, who represent the four Paths in the game. These are basically character classes (from left to right): Scholar, Ritual Master, Wandering Sword and Demon Hunter. In the podcast I explain those in more depth. Strange Tales of Songling isn't just horror. It includes unusual accounts of a wide variety, but I wanted to emphasize the creepier side of things in this cover. Still I think the cover hints at a lot more beyond that. In Strange Tales stories you never know if the monster is going to be a villainous threat or something more benevolent. Again, I get into this in the podcast, but I think the cover conveys better than I can, what I am trying to say here. You can expect to hear more about Strange Tales of Songling in the coming months. Here is a podcast discussion where I talk about the art and how it relates to the mechanics and setting of the Strange Game.